Well, just posted to tell you guys that I've joined (or currently about to join and waiting for confirmation) an MWS (stands for Mujin Wakusei Survive/Uninhabited Planet Survive) fanlisting, and pretty much the only one that I know of out there right now. (I did the button up there plus another one today; I'm quite proud of them. *grin*) I also listed it on my links page, so you can check it out there, too. So, then, that's all for now. Bye! I used that one on the link page. Anyhow, yes, I'm alive! School is now out, so...yeah. To tell you the truth, I think this site is sort of losing its usefulness as a purely CCS site, so if it isn't already, it's kind of a general purpose site for stuff I like. I hope nobody's too disappointed? If you take it, would you mind posting your result on a comment in my LiveJournal post here? I posted my result there, too. *grin* You can leave a comment on how well it matched you or something like that along with it, too. Even if you don't have a LiveJournal account, you can post anonymously and leave your e-mail or website or whatever. Well....nothing else for now, I guess. 'Till next time! I got an award from a site whose link I recently put up! You can check the Site section to take a look. 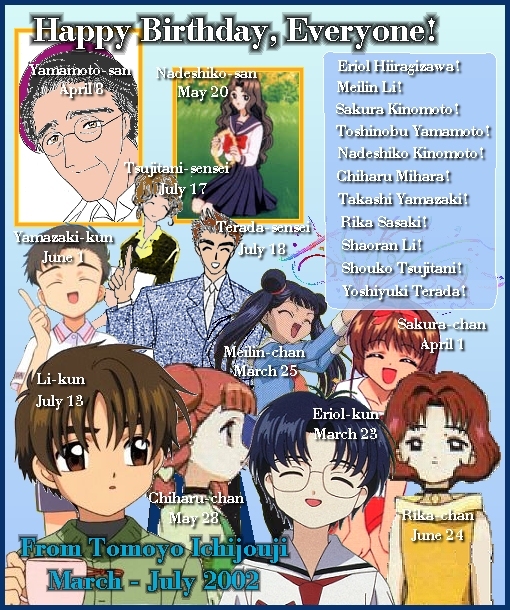 Also, tomorrow happens to be Leap Year's Day, which is also Touya Kinomoto's birthday. No, I don't have a birthday picture for Touya, so I suppose a text declaration will do. Happy Birthday, Touya Kinomoto! (For tomorrow, anyway). Hi...I dust off the dust again. Now it's only been a month since I've been here. (How pathetic, huh?) Actually, I'm "busy" with Suikoden III and Final Fantasy X-2, so I don't feel very inclined to do other extra stuff, including updating my website frequently. Hey, I'm human too, right? Well, I have one little update this time. I added a link to a Cardcaptor Sakura site of someone I know online. You can check it out at the links page. I guess there's not much else to say now, then. See y'all later. This place just gets dustier and dustier every time I get a chance to update it....it's been more than a month, what, two months and three days? (Yeah, I calculate it to make myself feel better...). I dunno if I mentioned that already, but I happened to finish the first 'chapter' (or next episode in series, really) of my PT fanfic. I don't wanna release it yet, I still haven't gotten people to read it over yet. And I still need to write more on the next ones. It's really long...like over 40 pages in Microsoft Word (I'm NOT exaggerating...o_O). Yeah, I've been absent. I know. So, I've prepared something (more like dug something out...) for this update so people don't think I'm dead. In the Site Trinkets section, I've added something new. They're not really for your site, though. They're Princess Tutu wallpapers, and I made them myself except for the actual creation of the images and the original video files screenshots are from. Technically, you're supposed to ask me for them if you want to put it on your own site. But, as long as you don't delete the credits (they're miniscule anyway) on the wallpaper and maybe put some kind of mention near the picture that I did it and some kind of contact w/it (be it e-mail or website) I suppose if I caught you I wouldn't be too upset. Oh yeah, I fixed the link to the PT e-mail on the text link above. It should work now, if someone was interested in that. Well, that's about everything for now. Hope everyone's having a great summer! Actually, I've added a staff photo update for Sailorryokowashu's site (the only one that seems to need updating anymore...) with a new member. Go to pg. 2 of the SPS to check it out. I have been working on the PT fanfiction, a significant more than I thought I would, so I am happy about that and hope I can keep up the pace and not taper off on it like my CCS fanfiction seems to be....*sweatdrop* Hopefully I can get something done on it after my PT thing is done. My, it's been a while! Sorry for the delay, I have finally put up the update to Sailorryokowashu's updated photo. If you want to take a look, check it out @ the S.P.S. page, as always. Alrighty, that's all for today (and for a little while, I guess). 'Bye! I put up a new Princess Tutu fanart, with Ahiru and Fakir (aka Fakia) in it. Take a look at the Fanworks page to check it out. That's all for now! So, if you'd like to take a look at that, go to the Fanworks page at the top for the link or here. Remember, it's a plan site, so things are subject to change! If you have some comments, e-mail me. That's all for now! It's the weekday, so this is a quickie. I found out that the videos page had all the wrong URLs for the download pages, and for how long, I don't know. But I fixed them now! If something doesn't work, tell me and I'll fix it as best as possible. Also, if people have been posting comments on my polls, I believe I've posted replies to a lot of them on the Tomoyo's Fanworks section in the polls. About all for now, I'll try to get some other stuff up soon! After a while of being unupdated (for lack of sites still active, I might add...), I've updated a photo for Outer Senshi Hangout in the Staff Photo section (pg 2). Go there for details on what was updated. Also, I added a link to a site that has some of my clips with permission, in case someone wants to download them from somewhere else (if my bandwidth runs out, for example). All for now. Yeah, I don't exactly update in liberal amounts, huh? An update! This time it's for the Fanworks section. No, it's not CCS (that must be getting old....but seriously, I'm this close to getting it up....I just need to get some written work on it and then I'll be satisfied enough to put it up - I mean, fanart alone doesn't tell a story, right? ), but it's a nice fanart I did for Princess Tutu, a cute shojo anime that fellow CCS fans will probably like (it involves ballet, a magical girl that the show is named after, a kind of fairy-tale-ish atmosphere that others say it reminds you of Utena, and a protagonist named Ahiru, which means duck). I've recently become a fan of it. *grin* Visit the Fanworks page to check out the drawing I did for it! Oh, I've also added a small freebie award for Easter on the site page, and reformated the section pages a bit. Finally, an update! I've updated the links page with an old link I decided to put back up (Tomoyo-chan.com, and I don't know how that was taken off in the first place! ), my sister's site, and an update on the dormant KH site URL. I also added an award to the sites page. I was kind of curt yesterday, sorry about that. I was kind of contrained on time. I updated the Fanworks section with icons I did for different CCS RPGS for original characters. I also added a link on the Links page to a very incredible and immense CCS site with movies, MP3s, images, interactive stuff, information, you name it! Almost makes me feel insufficient...oh well. No good feeling sorry for myself, now is there? I also remembered to correct the links of clips that had problems due to problems with the host. They're fixed now, and if they aren't, e-mail me and I'll get it fixed ASAP. I wonder why I just can't get up the nerve to put more of my secret CCS season (maybe I should call it that instead of the 4th season fanfiction!) images and writing up! Maybe I need a separate site for the purpose of rough draft...I should go do that. Okay, that's about it for now! See ya! Updated Site page with a gift. That's interesting, I posted exactly a week from my previous post. Pretty much just updates to the fanwork section today, with a little addtion to the intro (saying that you should ask me if you want to use it, etc. ), a correction to one of the dates (it was a year off) and a new fanart. It's again not C.C.S., but it's not Pokemon either. Hint: It's related to Pokemon, though, + it's also a widely-released-in-America show. Oh well, one of these days I'll get over my anxiety and get them up. Bye for now. [Later] Fixed the Poke-fanfic link, which was broken before. I haven't been putting up clips, I know. It's just not been convenient to put them up. I don't have a source for images (and I don't want this place to be a stolen-image gallery, obviously) and I'm still working on those fanart and fanfictions. Actually, I have a lot of stuff drawn and written, but I just don't see it fit to release them to the public yet. I'd only really do that if I could put a separate mini-site for my stuff. Then I could say that it's still being worked on, since there'd be a lot of them that are still in ideas. I put up a little counter for VideocaptorTomoyo[dot]com now, so I'll know who's coming and seeing my site. *grin* Finally! That's all for now, sorry. I noticed that I didn't upload the staff photo from two days ago correctly, so I corrected it now. Sorry about that! Okay, I haven't updated for a month & a week, and I missed several birthdays already. I guess I won't have time to celebrate them on here, oh well. Anyhow, I put up a link to my first finished fanfic, but it isn't C.C.S. (hint: it's another series well-known and widely released in the US - and it isn't Sailor Moon!) So you can check it out there if you're interested. Plus, I added a link to my weblog, if someone wants to actually read it. The link's appropiately on the link page. *grin* Could've guessed that, huh? So, I guess that's all I can think of to do for now. I'm finishing some fanart and getting going on the CCS continuation fanfic, so I guess those of you interested can look forward to that. 'Bye for now! [Later] I also put a correction note on the site in birthdays for Nakuru & Sonomi -- their birthdays are actually October 23rd, not the 13th! [More later] I also updated Outer Senshi Hideout's staff photo with taking off some staff that left. Goodie! I've been able to make a small update to the video section! Rejoice!! Well, I hope you enjoyed the New Year update! (With a possibility of more updates later! No promises, just in case, though! *grin*) For now, 'bye! Happy New Year's Eve & New Year's Day to you all! Well, I've got something to update with this time. *grin* I've posted a pair of banners in the Link to this Site section that I made myself, if anyone's interested. That's about all for now. So then, happy holidays! Well, while I'm here, I guess I'll wish everyone a happy holiday! *grin* Bye for now. I had drawn it on Tomoyo's birthday, but I had no chance to put it up until 18 days later. Sorry about that, Tomoyo Daidouji! Well, then, happy belated birthday! That's about all I can do right now, but if there's something else, I'll add it. *grin* Ja ne! The only thing I did today was to edit one of the links for the links page and stuff. Check there and you'll notice a new Soft Destiny one underneath the one that leads to the site and stuff. If there's anything else for today, you'll hear more. 'Bye! The only thing I did was to move a bunch of the news posts from here to the previous news section, and the cards on it to the site section. *grin* Hopefully it's less crowded here now! [Later] I've added notes to links that aren't there anymore or have changed somehow significantly, and I've noted on the networks that Sakura Candy is down. Awww. SailorRyokoWashu told me soon after that she wanted to put a new staff member on there, Aya-chan, and after that I got requests from Spotlight and Cardcaptors Rocks. Phew! I got them done, though, and their descriptions and all are at the SPS page. Well, then, that's about everything. 'Bye for now! Just a day after, I get another SP request! It was from SailorRyokoWashu, for two things; one, to update her photos for herself since she wanted to change hers, and another one that she works with that she referred me to. I was able to get them done today, though. Okay, that's about it. 'Bye for now! I've got some good news to say (you might be and might not be impressed), but I'll just say the other stuff first. There's a new photo in the SPS section for another site for Kawaii Little Wolf Shrine, and I've put a couple of the news posts down there and put them in the Previous News (and put a link to the birthday cards and stuff like that in the Site section as well). Now, then, for the news! I've finally posted some of my 4th season fanfiction! This is very big news to me, since I've been working on this for years (literally, if you count all the character designs and then the story development I've done in silence). There's not a lot right now (seven pages and counting for the first "episode" of it) but as I write it I'll post it some more. And I might be changing what I have up, too, and if it's something I deem big I'll tell about it. Well, that's about all for today. Good day! I'm also going to catch up with all of the birthday cards I've missed from March to July with this big one birthday card for everyone! Plus, I've added a Gif image I made myself (with labels and all!) 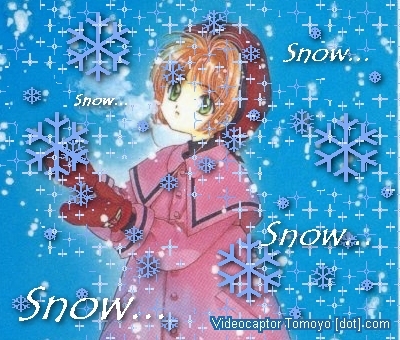 and you can find it on the Tomoyo's Fanworks page. *grin* That's about all! I think I'll be able to see Lilo & Stitch again! Yay! Well, that's about all for now! 'Bye!